The beautiful Hand-made Celtic Dragon Raku Urn is a ceramic stoneware cremation urn with Raku fired. Raku is a traditional an ancient Japanese firing process This is designed with Celtic Dragon. This cremation urn is a unique tribute to your loved one. The size and contemporary design makes this a good gift item and a versatile decorative piece of ceramics that will fit in any home. This is made in USA. The process of Raku firing differs from other firing methods because the pots are removed from the kiln at their maximum temperature. This and other ancient methods allows us to offer 9 basic finishes. Please click on the Detailed Images Tab below to review the available basic colors. 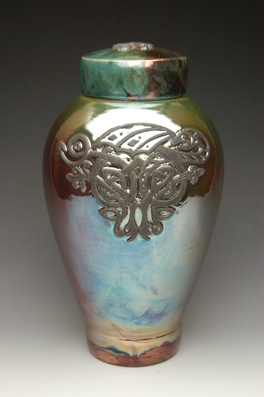 Please remember that each Raku urn is a totally unique piece of art; no two will ever be alike. You may be wondering about the lids. Some people choose to leave the lid unsealed as the ashes are kept in a sealed plastic bag. However, many choose to seal the lid. Please Click on Cereamic and Marble Sealing Instructions Here.